On the eve of the Winter Meetings, the Washington Nationals rocked the baseball world with one of the more surprising free agent signings in the past decade or so. Super-Evil-Genius-Agent Scott Boras worked his voodoo magic on the Nats once again. Washington came out of nowhere to sign former Phillie outfielder Jayson Werth. That was surprise number one. The second surprise was they signed the soon to be 32-year-old to a SEVEN year deal. Then every other GM's jaw hit the floor when they found out the deal was worth $126 million. I believe rival execs exact words were "Whaaaaa?" followed by profanity. In Werth's last three full seasons with the Phillies, he hit 87 home runs and averaged a .279/.376/.513 line while playing anywhere from excellent to very poor defense according to UZR. That makes him a good, not great, player on the wrong side of his career peak. Werth has been about a five win player over those three seasons which, dollar wise, would be worth between $21-23 million per year. But in giving him $18 million a year, the Nats are paying him for past performance and not what he'll do going forward. It's hard to imagine that Werth will be performing at an $18 million level when he's 37 and 38 years-old. Unless, of course, he finds some kind of magic cream that's the equivalent of the Fountain of Youth and Power. But that can't exist, right? The Nationals aren't a great fit for the soon to be 32-year-old outfielder either. Boras sold Washington two once-in-a-lifetime prospects in back-to-back years in Stephen Strasburg and Bryce Harper. Strasburg got off to a hot start in 2010 before his elbow had to be reattached with Tommy John surgery. I have a pair of pants older than Harper. I don't fit in them anymore and it's curious why I still own them but still... Strasburg and Harper won't join Werth until 2012 and there is no telling how effective they'll be once they do so. And Ryan Zimmerman is going to want to get paid after his contract is up in 2013. It just seems like the wrong time to make such a bold and expensive move with what the Nats are trying to build. Rizzo praised Werth’s athleticism, his base-running acumen, his ability to play center field as well as right. 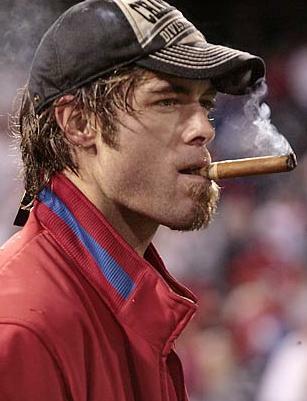 He raved about Werth’s offensive improvement, his increased patience at the plate. He described Werth as a late bloomer whose best days are still ahead. Some extra money is one thing, your soul is another. The obvious fallout from this is that Carl Crawford's price tag now starts at eight years and $140 million. And Cliff Lee won't even talk to you for less than six years and $150 million. And the upper torso of Vlad Guerrero now wants two years and $20 million. 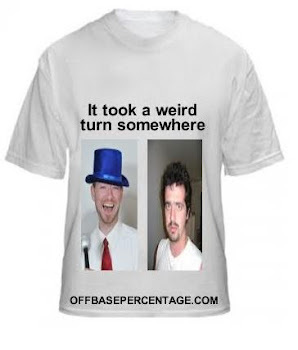 Labels: boras, jayson werth, mike rizzo is a puppet, nationals, smooth criminal, the upper torso of vlad, whaaaa?